Home > Nativities Sets > USA Nativities > Nativity Snowflake Hand Cast Stone Made in U.S.A. 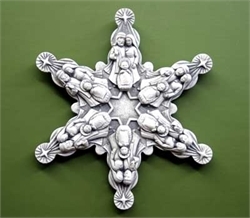 Enjoy a wonderfully creative way to show the Holy Family in the format of a snowflake sculpture. Hang it near an entry way or on the fireplace. This Christmas decoration would also make a meaningful holiday gift. This nativity has a Designer White Patina. The Designer White Patina consists of a hand applied charcoal tone on a fresh white base. Since colors are artistically applied by hand, no two pieces are exactly alike. Please allow up to 14 days to ship.